The Martial Art that will inspire you. Arnis/ Eskrima is the Philippine art of stick fighting. It consists of the handling of different weapons and as opposed to e.g. Karatedo, here the beginner starts training with these weapons straight away. Using these weapons offers a lot of advantages: they increase the self-confidence of the bearer in fighting situations, keep the attacker on a distance and allow a very efficient way of self-defence. 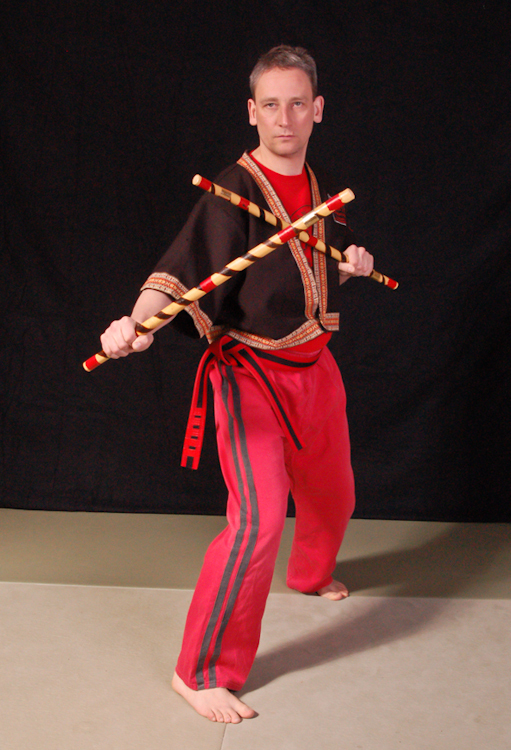 The first weapons used in Arnis/Eskrima are the “sticks”. These are about 60-70cm long made mostly of Rattan or fire hardened wood. Further on in training weapons such as knives, machetes, chain and staff will also be encountered. Also items of everyday life such as belts, umbrellas or even a rolled newspaper will be serve to train the application of the techniques. 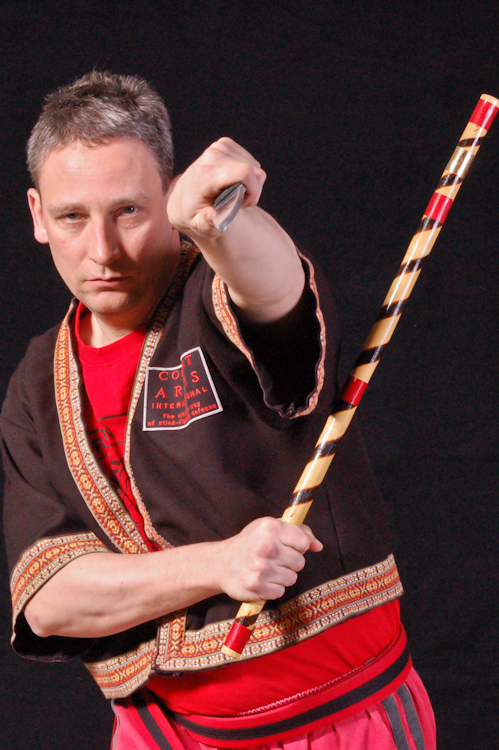 This is a great advantage Arnis offers in contrast to weapon less martial arts. 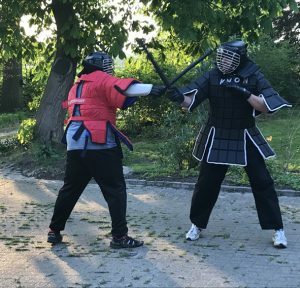 The techniques learned are so versatile that in almost all situations one can find items which can be used, or if not, use the principles in empty hand combat. 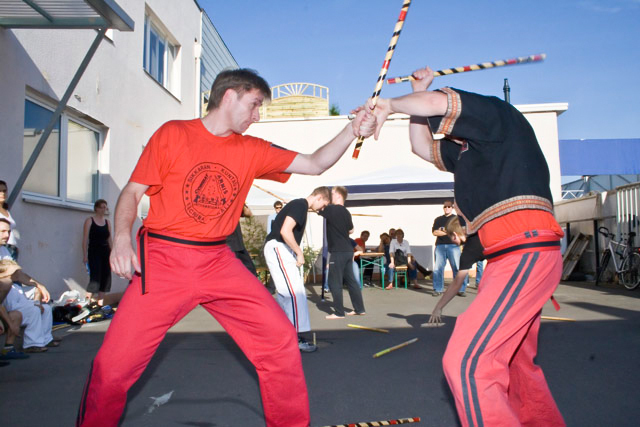 Not only the handling of weapons is part of the training in Arnis/Eskrima, but also defence and disarming techniques against armed and unarmed opponents are taught extensively. Also punching, kicking, throwing and holding techniques are an important part of the education. Concentration, peripheral vision, and agility are strongly increased through training. 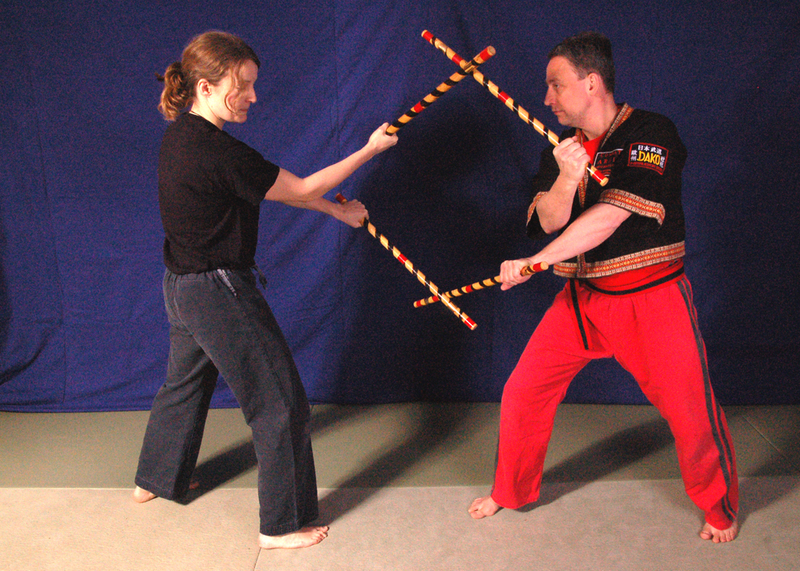 Arnis/Eskrima is an effective self-defence. (e.g. umbrella, book, belt) Sonquete, Tapi Tapi, Messer u.v.a. Walo, Otso, Siyete u.a. As Karatedo has its katas, Arnis has its own systematized and memorized fights against imaginary opponents called “anyos”. The first Anyo are taught with one stick or machete, the advanced Anyo will then be carried out with two sticks or two machetes. The advanced student will also learn the application of the Anyo with a real opponent. 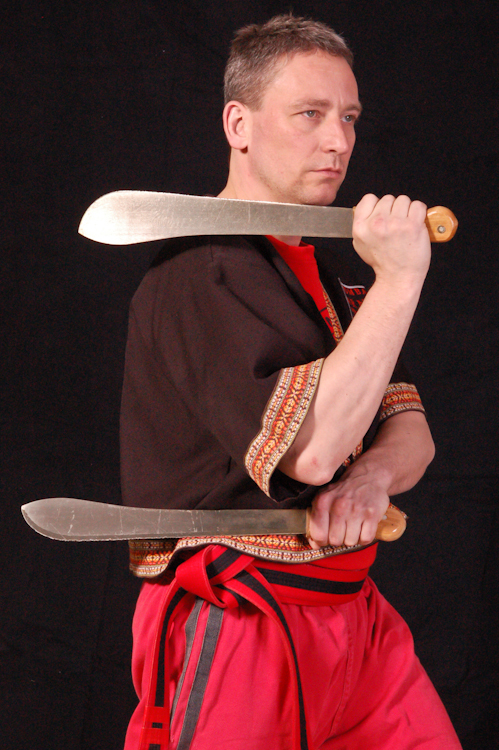 All this combined makes Arnis/Eskrima a highly efficient self-defence system, which can be learned by everyone. Only after a short time of training the student is capable of using very efficient technique for self-defence. 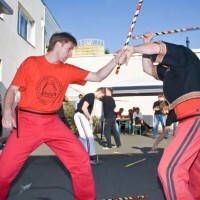 A large number of fighters have formed and further developed stick fighting throughout the centuries. 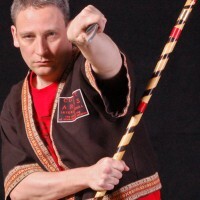 A large number of fighters have formed and further developed stick fighting throughout the centuries. 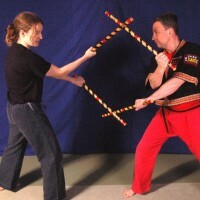 Present-day Arnis mainly originated in the Philippines. The Filipino grandmaster Cui Brocka and the German Arnis master H. D. Rauscher were the first to introduce Arnis in Germany in 1970. H. D. Rauscher is the chairman of the German-Asian martial arts organization D.A.K.O. 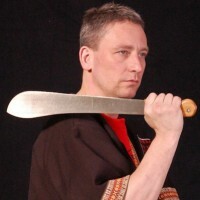 Olaf Lotze-Leoni is one of the few people in Germany and Europe holding a 6.Antas (Lakan Anim) in Combat Arnis. He has been a direct student of H.D.Rauscher 9.Antas for over 25 years now. 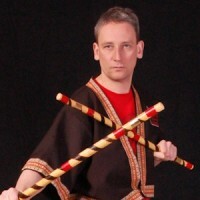 He is the highest ranking Combat Arnis master in Northern Germany. Co-Trainer are Jan Bickmeyer 2.Antas and Ingo Blencke 2.Antas. If you are interested in weapons and self-defence don’t miss it.